For as long as I can remember, I have posted about my shopping trips on Tuesday mornings here on this little old blog. I shop on Mondays as a general rule, and write up the post on Monday nights or early Tuesday mornings. I wanted to see one of his shows to get a full understanding…so I stayed up late watching EM:WLE and it didn’t let me down. His approach is way better and way healthier than the other unnamed show. I love that it doesn’t have a competition factor, and that relationships aren’t broken/damaged by voting off, etc. Anywho…I got so sidetracked and completely forgot to write up about my grocery trip. Which turns out was very, very, very uneventful! There’s nothing terribly exciting about this trip. Got 2 packs of TP, as our stockpile is running low. And a few special (and expensive) snacks for Tyler. That’s about it! Total for the month: $208.60 + $20 for the berries + $78.97 = $307.57 Just barely over my $75/week budget for June! I love how well you do on your shopping trips! 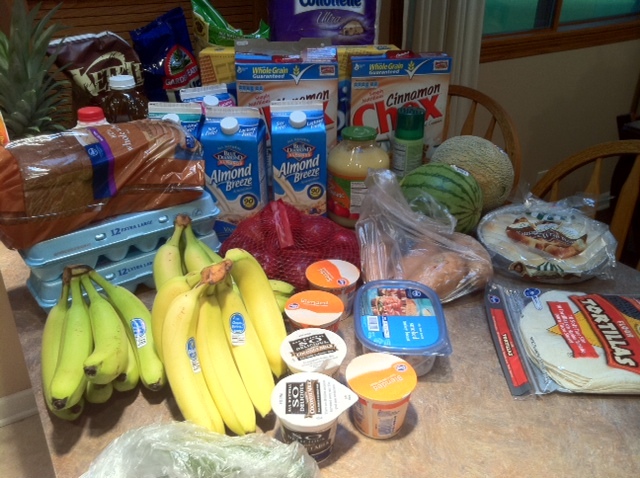 I also love to see you do a trip that looks a lot like mine:) We are a family of 6 and I do use coupons and get good/free deals, but also tend to overspend on fruits (that we eat or freeze if not eaten before they go bad), and dairy products. We drink about a gallon of milk a day and eat lots of cheese and yogurt. And the eggs are so high in price but we eat lots of them also. Thanks for bringing reality to your grocery bag every now and then! My husband and I absolutely LOVE that show! It comes on so late here that we watch it online the next evening, and it is very inspiring and encouraging. It is very cool that you got to meet Chris! Aw, hope your little one feels better soon! Every now and then we invest in specialized snacks – you’re right, they can be pretty expensive, but worth it if they help allergies and all that.